Chicago Burlington & Quincy Railroad E7 9920A at the Eola Illinois Reclamation Plant on October 11, 1964, photo by Chuck Zeiler. This appears to be the back half of the fireman's side of 9920A. 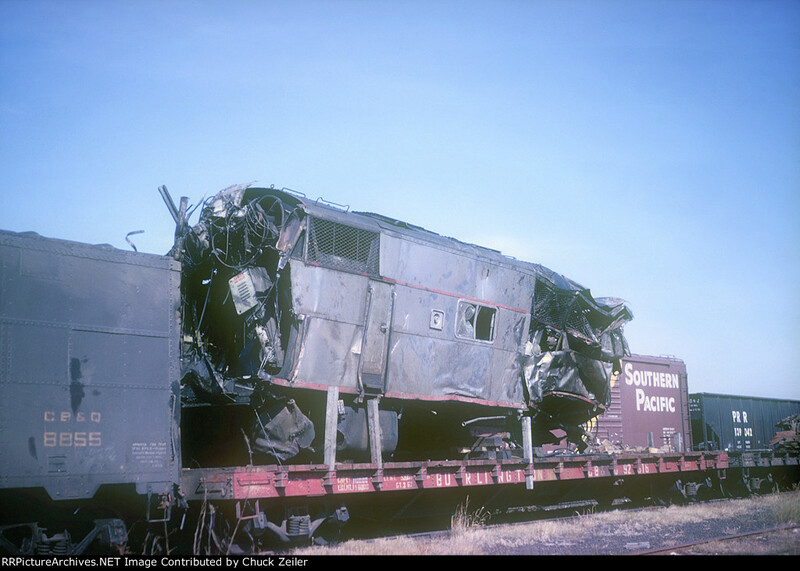 Number 9920A (c/n 2946) was the lead unit of Train Number 3 on September 27, 1964, which was mis-routed into a standing detouring Rock Island train, destroying both lead units and killing four railroad employees. It is seen here at CB&Q's Reclamation Plant, held for a few weeks while the investigation took place. Unfortunately, because of the way the rules are written, the detouring railroad (the Rock Island in this case) pays for all damages and expenses associated with any accidents involving their train.